WERNER PARAVICINI. — Die Nationalbibliothek in Paris. Ein Führer zu den Beständen aus dem Mittelalter und der Frühen Neuzeit. ALAN R. EAGER. — A Guide to Irish Bibliographical Material: A Bibliography of Irish Bibliographies and Sources of Information. E. H. HUNT. — British Labour History 1815-1914. DAVID GAGAN. — Hopeful Travellers. 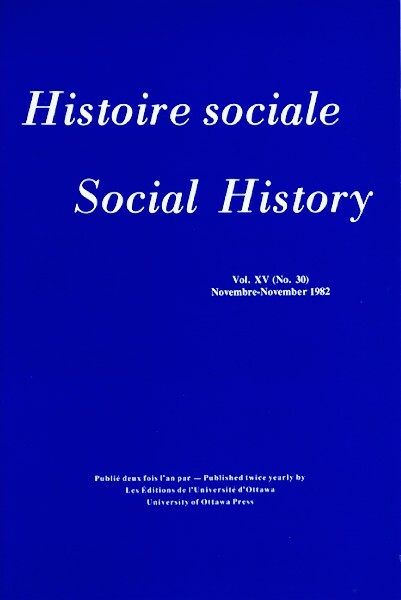 Families, Land, and Social Change in MidVictorian Peel County, Canada West. CLAIRE DOLAN. — Entre tours et clochers. Les gens d'Église à Aix-en-Provence au XVIe siècle. LOUIS HENRY. — Techniques d'analyse en démographie historique. JOHN G. CLARK. — La Rochelle and the Atlantic Economy during the Eighteenth Century. ERIC J. HOBSBAWM, ed. — The History of Marxism: Marxism in Marx's Day. Volume One. DONALD H. AKENSON, ed. — Canadian Papers in Rural History. D. J. HALL.— Clifford Sifton. Volume I, The Young Napoleon, 1861-1900. GRAEME WYNN. — Timber Colony: A Historical Geography of Early Nineteenth-Century New Brunswick. FRANÇOIS GENDRON. — La Jeunesse dorée: Épisodes de la Révolution française.